AIR Control Display marks the heart of a radio or transponder installation. It can be connected to an aircraft radio, a transponder, or both simultaneously. The user interface, that is the display content and the use of controls, automatically adapts to the installation environment for optimum clarity and ease of use. Data on the display is kept as large as possible, controls are simple, intuitive, and consistent throughout the entire system. AIR Control Display is a real communication talent. It not only works with the new AIR COM aircraft radio from AIR Avionics, but also seamlessly integrates with third party aircraft radios such as the Becker Avionics 620x series or the Dittel/TQ KRT-2. 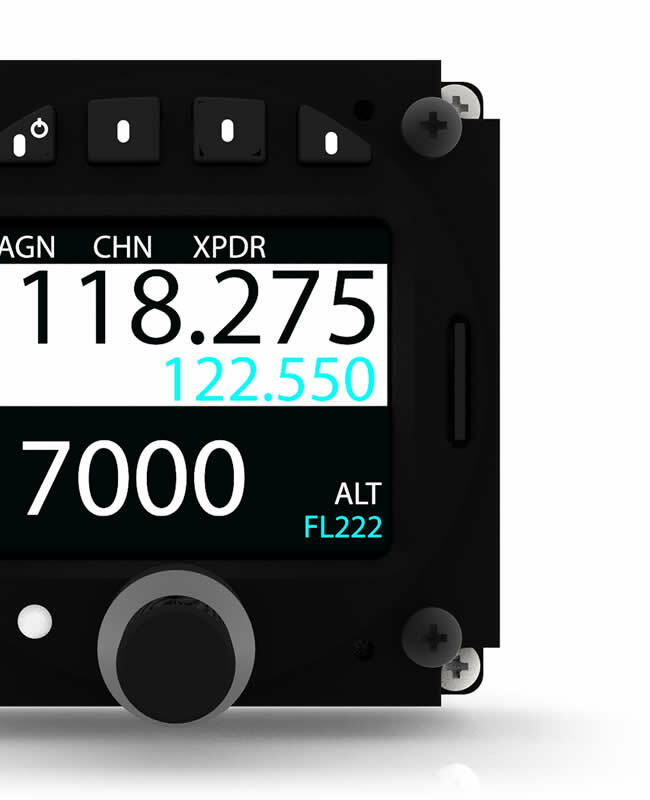 Additionally AIR Control Display connects to the well proven line of AIR Avionics Mode-S/ADS-B transponders. AIR Control Display features the industry’s largest display area in a 57mm control head. Its stunning color screen is perfectly readable in bright sunlight. Yet it draws very little power. The design has been developed and tested to comply to strict aviation standards such as shock, vibration, or high/low temperature. Air Control Display uses a GPS interface and a station database to display names of close-by stations. This simplifies station identification and reduces the potential for errors. A list of nearest stations can be displayed and corresponding channels can be easily selected without the need to tune them in manually. This saves many seconds of head-down-time per flight. Manually tuning 8.33kHz channels with a rotary knob can be a painful process. AIR Control Display features an intuitive quick select method. With a simple push and turn gesture you can select channels in 8.33kHz steps, with a normal turn in 25kHz steps. Although being packed with features, AIR Control Display is easy to use. The user interface was specifically designed for pilots and thoroughly tested. The robust controls feel great and make selecting channels, entering squawk codes, or changing audio parameters a breeze. If only an aircraft radio is controlled, the active and the standby channel is displayed using very large letters. 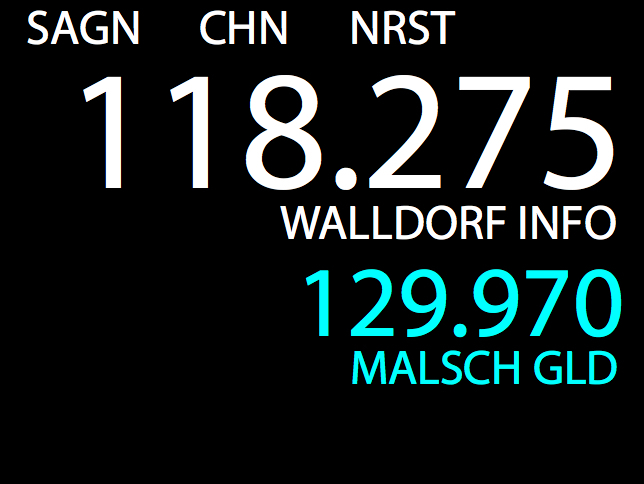 Additionally, station identifiers can be displayed. The rotary knobs control the volumes (active and standby channel), the rotary knob push button toggles active and standby channel. The push buttons on the top of the display trigger commonly used functions such as channel selection (CHN), a nearest station list (NRST), or the “say again” function (SAGN, AIR COM only). 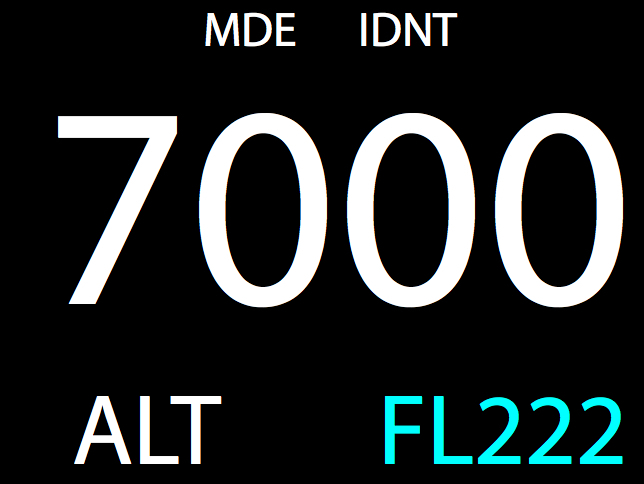 If only a transponder is controlled, the current squawk code is displayed using very large letters. Additionally the current operation mode (here: ALT) and the transmitted flight level are shown.The rotary knobs control the squawk code. The push buttons on the top of the display trigger commonly used functions such as operation mode changes (MDE) or the “ident” feature (IDNT). 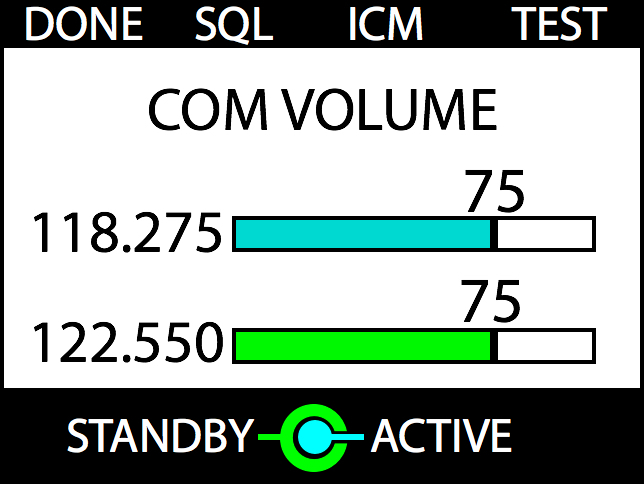 If a COM and a transponder is controlled, data from both systems are displayed using large letters. The rotary knobs control the COM volumes (active and standby channel), the rotary knob push button toggles active and standby channel. The push buttons on the top of the display trigger functions such as the “say again” function (SAGN, AIR COM only), channel selection (CHN), or transponder squawk code and operation mode entry (XPDR). Selecting a channel from a close by station is a simple process. First the NRST push button on the top of the display is pushed, then a station is selected with the rotary knob and the selection is executed with a push on the rotary knob push button. The standby channel now has the value of the selected channel. To toggle active and standby, another push on the rotary knob push button is used. Air Control Display is capable of controlling two independent volumes for active and standby channel (available with AIR COM aircraft radio only). You can individually adjust both volumes in order to better differentiate incoming transmissions. The monitoring of the standby channel can be deactivated by setting the standby channel volume to zero. Even if controlling a radio and transponder simultaneously, squawk code entry is easy. 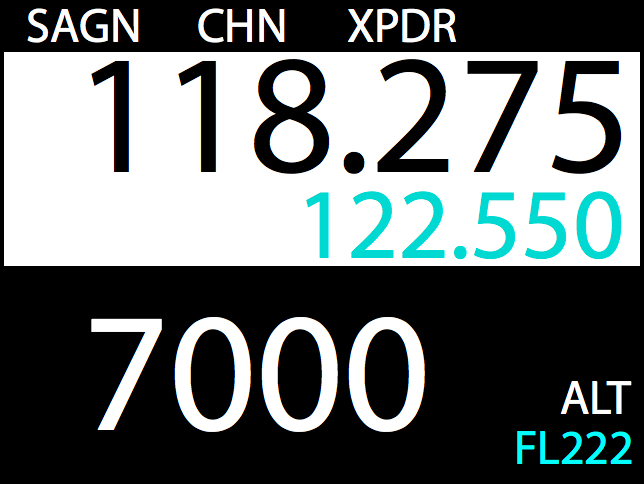 With a push on the XPDR push button on top of the display, a menu is opened. The squawk code is entered using the rotary knobs and the entry is executed by a push on the rotary knob push button. AIR Control Display is compatible to the AIR COM aircraft radio, the VT-01 Mode-S/ADS-B transponder and aircraft radios from third party manufacturers like Becker and TQ. It accepts RS232 GPS Data in the standard NMEA protocol for its GPS based functions. AIR Control Display fits into a standard 57mm cutout. It features an integrated encoding altimeter and two data connectors for easy interfacing to transponders and radios. Multiple AIR Control Displays can be used in a single aircraft. AIR Control Display is currently in certification. 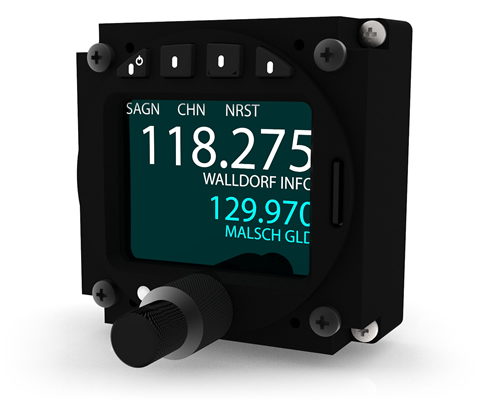 We work hard on releasing AIR Control Display as soon as possible in 2017. We currently expect first shipments in late spring/early summer.